It’s also giving rise to a rebirth of Pietism; this isn’t surprising when you consider that CSM flowered in the antibiblical monastic traditions of apostate Roman Catholicism. As the evangelical fad of CSM expands there’s a decided charismania also developing, which is producing a syncretism where Word Faith heretics like Joel Osteen and T.D. Jakes are essentially considered mainstream now. With all of this has come more and more people claiming to have direct experience with God. The end result is making the climate more condusive for things like Beth Moore Recommending “Jesus Calling” Book Claiming Direct Divine Revelation. This is the backdrop upon which to better see what’s happening as you watch the video clips to follow below from the Passion 2012 Conference. This conference has been going on in Atlanta, and was largely aimed at young adults and students. Years of emerging bombardment of pro-CSM propaganda aimed at younger sectors of the Christian community fired right out of evangelical publishing houses has also had much effect upon the broader culture of the more charismatic/emotion-driven side of the church visible as well. To serve as an illustration, below we have SBC Lifeway-sponsored Beth Moore praising an apostate (at best) Roman Catholic mystic and the crown jewel of CSM. Moore’s admitted practice of some form of CCP, which is actually divination, has opened her up to even receive direct revelation and visions from God. Below from a 2002 series called Believing God, available right now at Lifeway’s website, Moore describes a vision God gave her concerning His Church. By the way, the other extreme teaching in the Body of Christ that Beth Moore sees is what she calls “sensationalism.” Something I personally think she’s now become involved in. As I said earlier, the CSM being dabbled with now in mainstream evangelicalism is bringing about a form of Pietism; an emotional, sentimental, emotion-driven form of worship. What you saw at Passion 2012. Pietism is difficult to define because it can be taught and practiced in an unlimited number of ways. Some versions appear to be innocuous while others are so radical that most people would see that something is wrong. I now know that no version of pietism is actually innocuous. If a teaching is called pietism but teaches no more than what God has always used to sanctify Christians, then it is not really pietism. Real pietism always harms those who embrace it. The essence of pietism is this: It is a practice designed to lead to an experience that purports to give one an elite or special status compared to ordinary Christians. The Bible addresses this error in the book of Colossians. The false teachers in Colossae claimed to have the secret to a superior Christian experience that would cause people to rise above the bad “fate” they feared. Paul went on to explain that they already had everything they needed through Christ and His work on the cross. Another way of stating this is: If after having fully trusted Christ’s finished work on the cross, you are told that you are still lacking something, you are being taught pietism. Church history is littered with misguided pietistic movements. Many of them are linked with mysticism… Pietism can be practiced many ways including enforced solitude, asceticism of various forms, man made religious practices, legalism, submission to human authorities who claim special status, and many other practices and teachings. 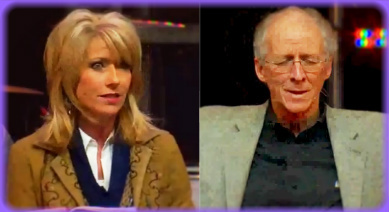 Now I’ll show you something that gives us real cause for concern in the seeming dangerous drift of Beth Moore and John Piper. Following are clips from Session 5 of Passion 2012 where we were to enter into the silence to let God speak to us, not only through Scripture, but directly inside of us as well. However, this is language actually straight out of CSM and can also refer to the TM-lite of CCP.